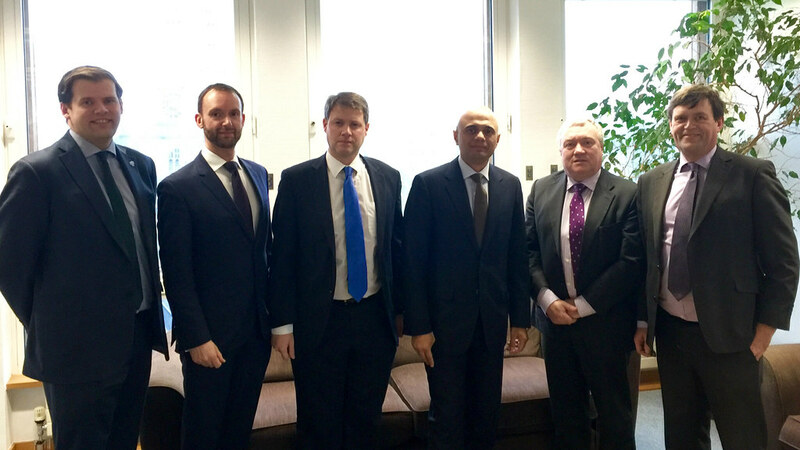 The Secretary of State for Business, Sajid Javid, met with University of Bath representatives to hear plans for a new world-class automotive research centre. Mr Javid met with the University of Bath’s Vice President (Implementation), Steve Egan, along with Dean of the Faculty of Engineering & Design, Professor Gary Hawley, and Director of Research & Innovation Services, Dr Jon Hunt. The Secretary of State for Business, Innovation and Skills, Sajid Javid, today (Thursday 25 February 2016) met with representatives from the University of Bath where he heard the latest developments in the University’s plans for a new world-class automotive research centre to be built at the Bristol & Bath Science Park. Mr Javid met with the University of Bath’s Vice President (Implementation), Steve Egan, along with Dean of the Faculty of Engineering & Design, Professor Gary Hawley, and Director of Research & Innovation Services, Dr Jon Hunt. In a constructive meeting, Mr Javid was presented with the University’s proposals to build a centre which will deliver transformational research for new automotive propulsion technologies. The proposed £50m project will bring in new investment and jobs to the West of England, as well as providing state of the art facilities that will benefit a range of industry-led collaborations. It will also have educational value bringing forward new undergraduate/masters and PhD training opportunities, and help upskill the current workforce to support the expansion of the automotive propulsion industry. On a national level the facility would build on links with the National Composites Centre and contribute to the Government’s Propulsion Nation vision, which aims to deliver world-leading technologies as part of its strategy to support the automotive sector. Mr Javid was encouraged by the response of industry and universities to the Government’s lead in developing the country's strength in the automotive sector. He said: “The new automotive research centre proposed by the University of Bath is exciting and demonstrates the determination of our auto sector to maintain its position as a world-leader. “Government and industry is already working together on research and developing low carbon propulsion and driverless cars technology, but we can do more to help universities and industry collaborate to ensure we have the right skills for a 21st century auto industry and give us a stronger competitive edge. Steve Egan, Vice-President (Implementation) of the University of Bath added: “The planned structure and operation of this proposed institute will be unique in the UK. The proposed Institute would build on the longstanding achievements of the University’s highly regarded Powertrain and Vehicle Research Centre (PVRC) which has been conducting prize-winning automotive research for over four decades. Last year, the University was recognised as one of the UK’s leading automotive propulsion groups, having been selected as a Spoke of the Advanced Propulsion Centre (APC).